Hi everyone!! I'm kind of giddy about today's manicure. I just adore sheers that are jelly formulas and allow you to build color or layer for new shades. So when these came out I had too many ideas swimming in my head for what to make with them, so naturally I stalled. 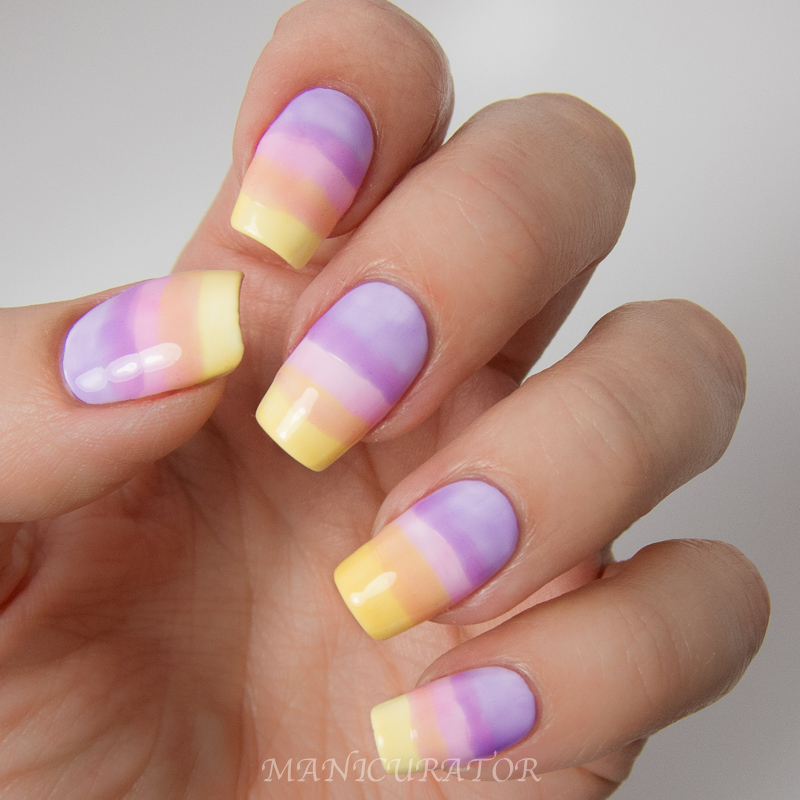 LOL I knew I wanted to show off how they combine with each other and then I just saw a sunset in them and this mani was born! 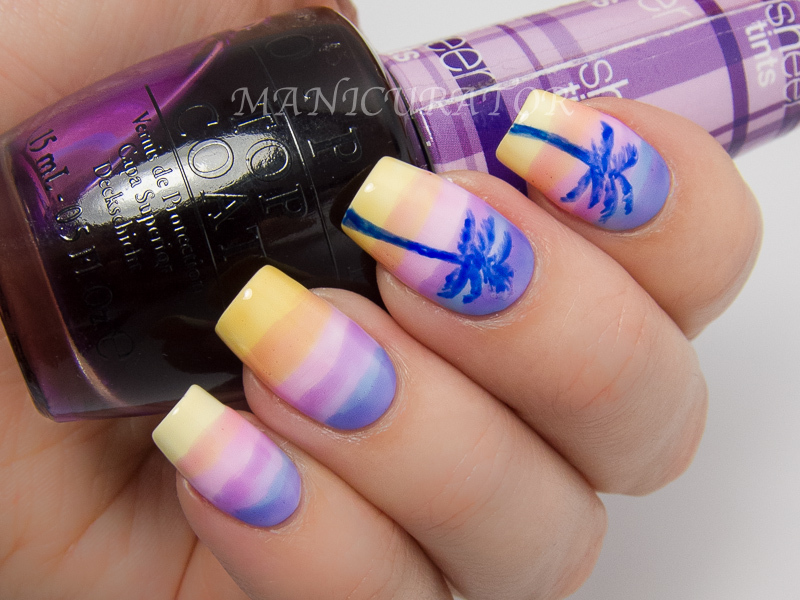 It's been sitting in my photo library for some time waiting patiently to get published but when I saw the Lacquer Legion (LL) theme for this month - On Holiday - I knew they had to be even more patient and wait for today. It's my first time contributing to the wonderful LL monthly nail art challenge. 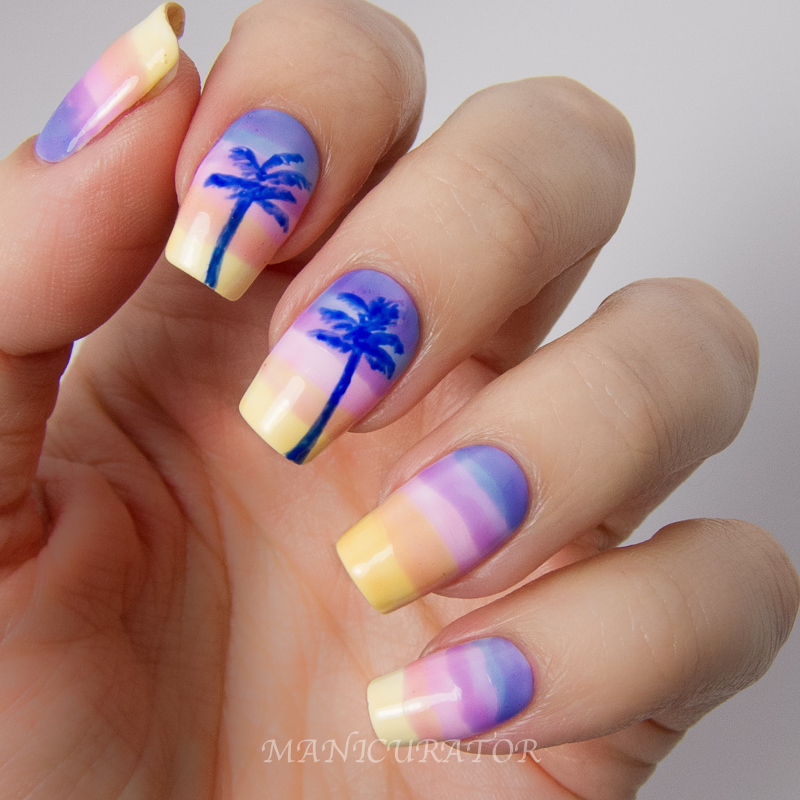 Sheer Tints and blue acrylic paint for the palm trees. 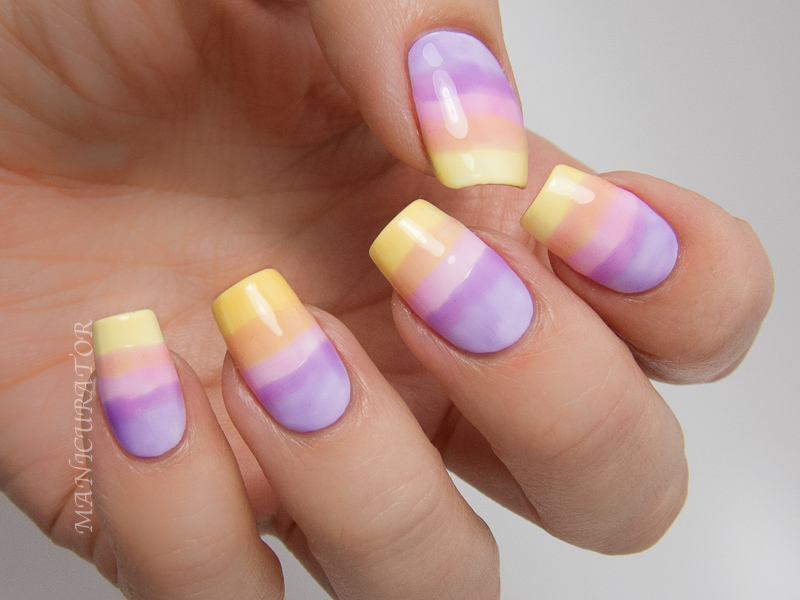 The procedure to get this gradient could not be easier. I started with the tip off the nail and simply swiped horizontally with I'm Never Amberrassed. I let it dry for a minute then repeated with Be Magentale With Me, overlapping and you can see it made a pretty peachy orange shade. I covered the rest of the nail with Don't Violet Me Down, also overlapping on the pink. I loved this so much I snapped a few photos as is! To complete my design I added the fourth shade I Can Teal You Like Me at the cuticle. Then I layered a bit more of Don't Violet Me Down to darken up the blue. 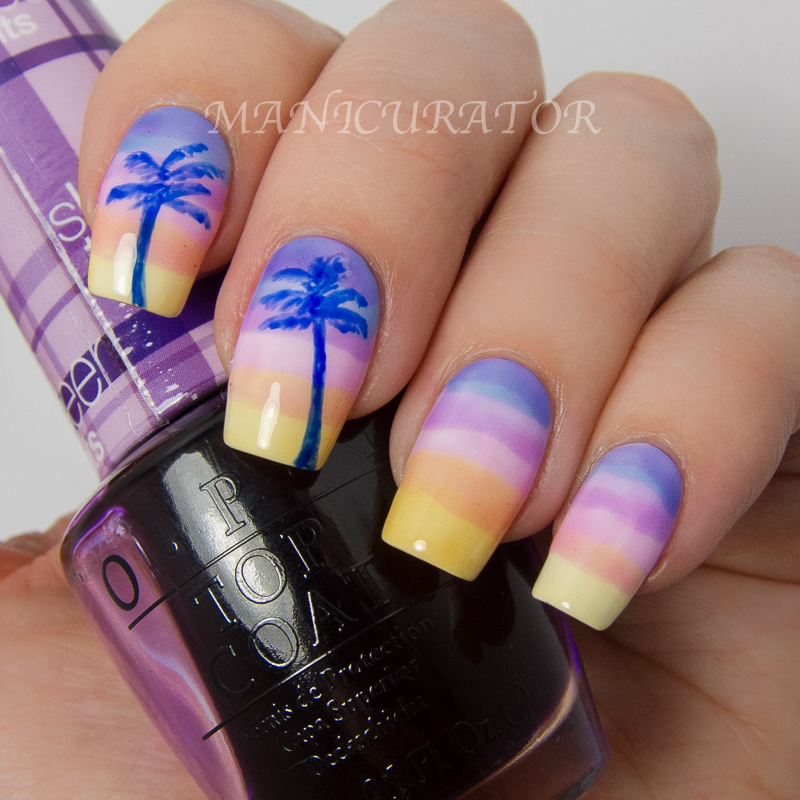 I used cobalt blue acrylic paint to freehand the palm trees and top coated. Done! I adored wearing these and can't wait to play around with the Sheer Tints again! I'm hoping we see even more Sheer Tint shades in the future! Are you a fan? Sheer Tints features OPI’s exclusive ProWide™ Brush for the ultimate in application. Sheer Tints will be available March 2014, at Professional Salons, including Beauty Brands, Beauty First, Chatters, Dillard’s, jcp Salons, Pure Beauty, Regis, Trade Secret, ULTA and ulta.com for $9.00 ($10.95 CAN) suggested retail for each nail lacquer. Gorgeous! I love the trees! This is FAN-freaking-Tastic!!!! omg seriously in love. Love these! 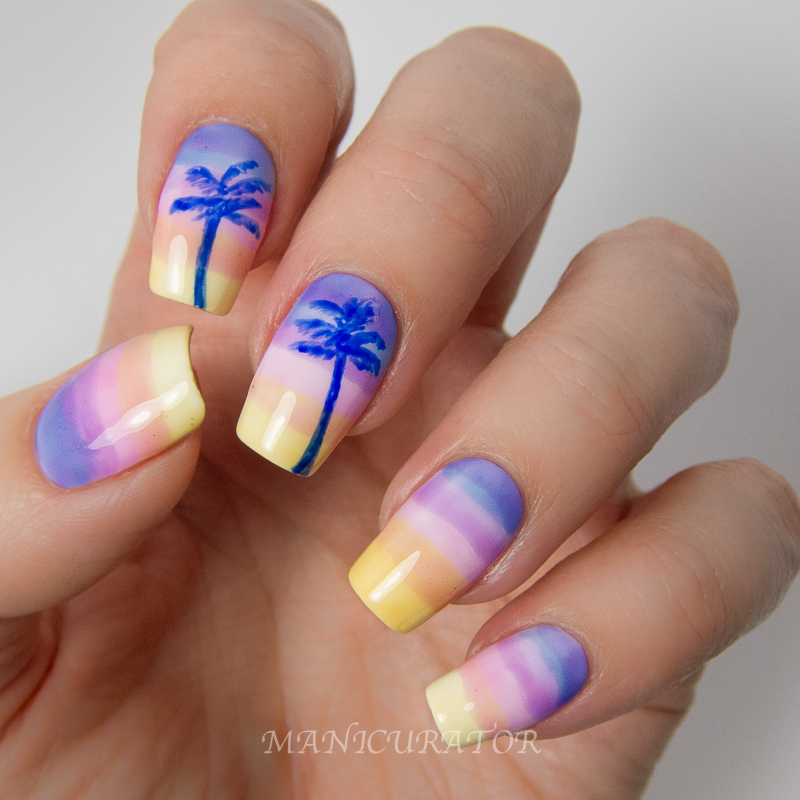 I haven't used my Sheer Tints yet, but this is pretty inspiring! Love! Very, very cool. I have got to try this! Just today I finally got my hands on the Sally Hansen Triple Shine Jellies. I can't wait to experiment. Love this. Love love love :) This makes me want the Sheer Tints!